I made three friends with this salad. One large handful of baby spinach topped with an avocado, three tomatoes, a third of red pepper, greek feta cheese, sunflower seeds black pepper and a house dressing (olive oil, cider vinegar & tamari sauce). This salad is a staple in my house. Common additions include cucumber and cilantro leaves. How you cut salad ingredients is important. If you make the pieces too large or small they will be difficult to eat or end up on the bottom. I've found slicing red pepper half a centimetre and then cutting those slices in 3cm sticks is ideal. I like my tomatoes in wedges, about ten for a vine tomato, but half wedges work well too. Avocado should be pre-sliced into one centimetre cubes and then scooped out with a spoon. 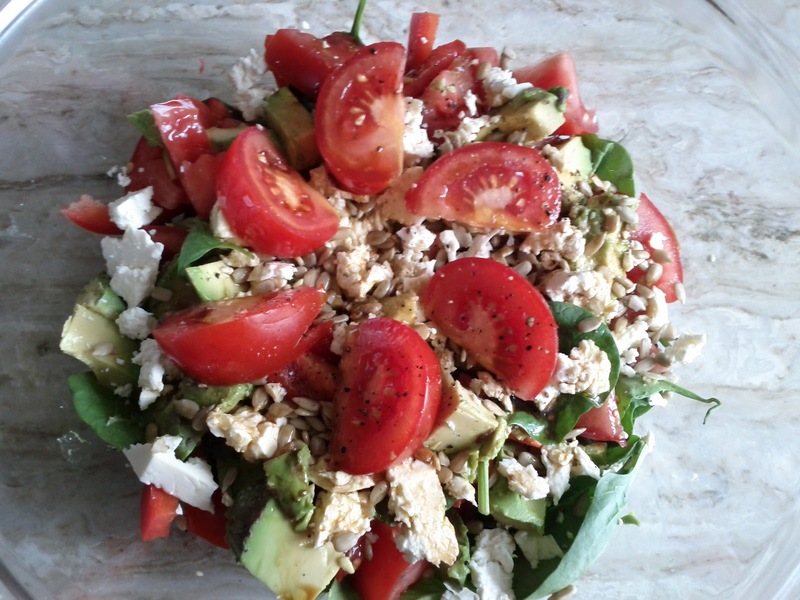 Only use avocado in a salad when it is perfectly ripe, when a squeeze of the bulbous bottom gives slightly. If you use cucumber, they are best in quarter circles. Feta is good cubed, but looks and coats better when crumbled. Leave the dressing until the last minute to prevent the greens from getting soggy. I prepare it in a shot glass and leave it aside until eating time. Pesto and mustard are both great additions to the house dressing.